For over two thousand years, China practiced what came to be known as the “tributary system,” reflecting the view that it alone was the center of the civilized world. All who wished to do business with the Chinese were considered tributary states. Rulers and travelers from other lands had to follow certain procedures, including gift giving, in order to associate or do business with them. When Japan ignored this policy, it brought about two invasion attempts by the Mongols under Kublai Khan. Now, that line of thinking has morphed into something quite interesting, which may one of these days come to be known as “The Great Gold and Silver Migration,” the transfer of massive amounts of true wealth – precious metals – from West to East. In nature, a tributary is a smaller stream flowing into and feeding a larger stream or river. Around the globe, several “tributary trends” are coming together in order to feed the Chinese (and Indian) precious metals’ demand river, with major supply-side implications in the near to intermediate future. The Chinese gold accumulation “river” has feeder supply streams from a variety of sources swelling its in-country gold tonnage. Quite a bit is imported legally through Hong Kong. Until this year, this statistical source was a reasonably accurate representation of publicly-accounted for gold coming into China. However, Beijing and Shanghai are now ports of entry for a considerable volume of bullion, so annual import totals have become much more difficult to quantify. 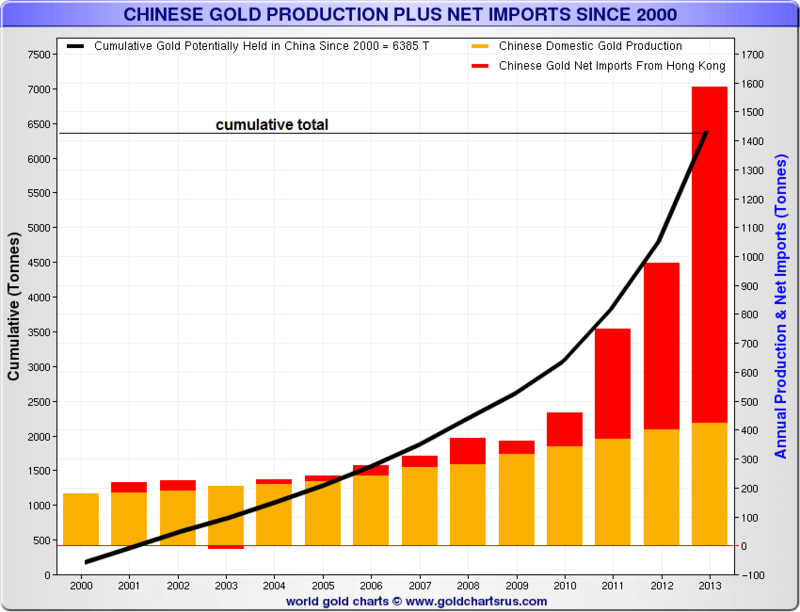 For 2013, several sources have estimated total Chinese gold imports at 2,000 to 2,200 tons. If this was indeed the case, then it would be the equivalent of over 80% of global gold production for the year! In an official Chinese Press Release about the China Gold Yearbook 2014, the Chinese Gold Congress (CGC) in Beijing stated that gold demand in 2013 was 2,199 tonnes, and 2014’s numbers continue apace. China encourages its citizens to buy gold – jewelry, numismatic coins, or bullion. Another tactic – though extremely difficult to quantify – is the effort by Chinese business and government entities to purchase gold and silver properties for their future production capabilities. Over the last few years, Bolivia, Argentina and Chile (also copper deposits) have seen considerable activity of this nature. Not long ago, China approached Barrick Gold about a partnership in its cost over-run plagued Pascua Lama project, a massive gold-silver property which straddles the Argentine-Chilean border. Will Leased Gold from Central Bank Vaults Ever Be Returned? "I believe that most of the Western world’s gold, which is supposed to be in central bank vaults, has been leased out. Much of it is now in private hands in India, and what remains continues going East to China and other Asian vaults. So most of the Western gold has vanished from the vaults, and it’s now just a book entry." One thing both precious metals’ bears and bulls agree upon is that for uncertain times, holding gold and silver can make a lot of sense. The saying that “silver can feed your family and gold will save your life” has the ring of truth – fully borne out by history. But the larger rationale for holding precious metals is even better – when times are good and people have more disposable income, as literally hundreds of millions of “Chindians” are in the process of achieving right now – the buy-and-hold demand for precious metals looks destined to rise in a big way and continue doing so in the foreseeable future. 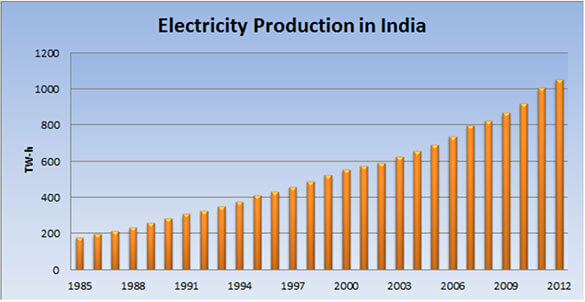 Below is a chart showing electricity production in India. This core measure of economic activity demonstrates a well-entrenched trend showing no signs of abating. Add the surprising election win earlier this year by reputed free-market advocate Narendra Modi as India’s new Prime Minister, and you have the ingredients for stronger economic growth, concomitant with continued robust domestic demand for gold and silver. "We are gold investors because we have made a specific and calculated bet against paper money. Simply put, we are betting against paper money as a store of value. We believe its supply will continue to increase. We do not believe that the world’s major governments have any stake left in protecting it. Gold bull markets are unique in that buying becomes driven by both fear and greed. Gold is quickly moving into the hands of those who are unwilling to gamble on fiat currencies or bonds as a store a value. The new owners of gold are unconcerned with its lack of yield but instead are focused on its historic ability to preserve wealth and its unquestionable value." Buy the physical gold and silver you anticipate wanting to acquire in the future… Now!